Mr. Guruprasad Shanmugham from Graphic Systems sent us this pic of him getting the BlackBerry Phone..
Black Friday Promotion in ON! As promised, we have come up with an awesome deal to make you a lot of cash and also make your friends and family happy by giving them hosting at a discount of 40% FLAT. Whats more, since this deal is sooooo good, we have made it available for 3 whole days (Friday to Sunday). Grab your affiliate code and use it everywhere, then along with it ask people to use the discount code (40black) to get a cool 40% off on their hosting purchase. Remember to login to your affiliate control panel from your client area so that you are ready for friday, if you have not already activated your affiliate account then you can do so by following the steps in our affiliate signup article. That’s it! The more you spread the word, the more money you can make. – You cannot use your own affiliate link with discount code for your own purchase, such orders will be cancelled and no commission will be issued. However you can use the discount code to purchase hosting at a discount. October contest for BlackBerry Curve is now closed, we have had overwhelming response for the same and the winner will be announced on 19th Dec 2011. 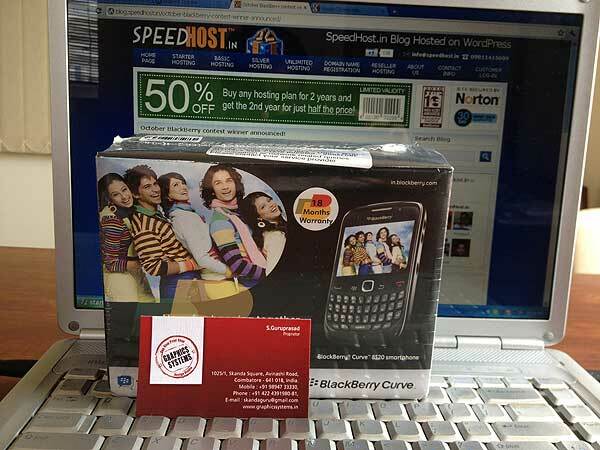 We will be giving away an BlackBerry Curve 8520 to a lucky client who buys hosting from us this month. All you need to do is buy a hosting plan and you will automatically be entered in the lucky draw. As with any context, there are terms and conditions… please be sure to read them. 2. Buying only domain name will not qualify you for this contest. 3. This contest is only valid for clients who buy any shared hosting plan or reseller hosting plan on yearly payment terms. 4. The draw will be on 10.11.2011 at our office in New Delhi and client need to have active status on their hosting to qualify. 5. The winner will be notified by email / phone call. 6. We will not pay for enabling BB services on your phone. Watch out for our August newsletter for the announcement of the winner of Ipad2 contest!